I can’t remember where I first heard about fireweed tea, but once I did, I knew I had to make it. 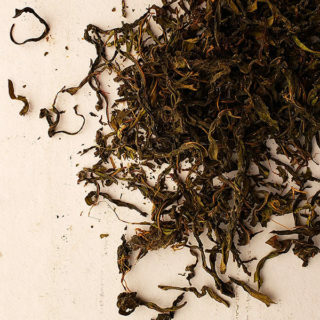 Unlike every other herbal tea I’ve ever heard of, fireweed tea is not just dried leaves in hot water: The leaves are fermented, just like those in black tea. The result is a tea you can make at home that tastes very much like the black tea you buy in the store — only no caffeine. First, what the heck is fireweed? Chamaenerion angustifolium lives across the Northern Hemisphere, and down into the Lower 48 in mountainous regions; it’s very common in the High Sierra here in NorCal. You can find fireweed in most American states and all of Canada, as you can see from this map. 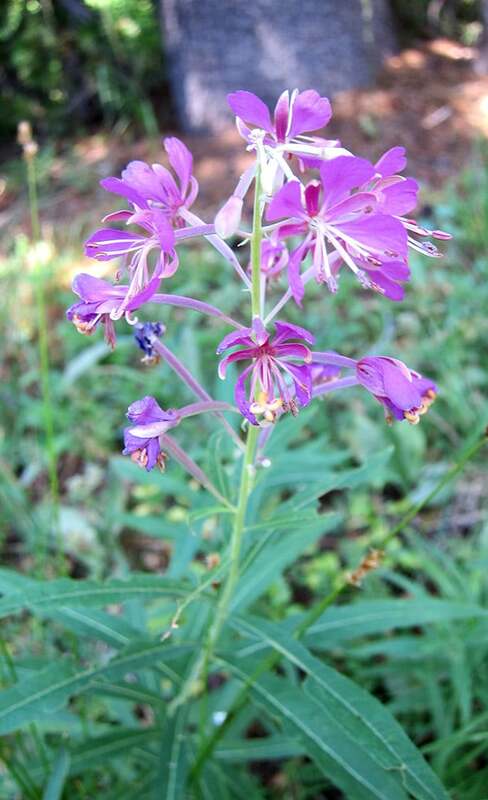 It likes to colonize places that have burned or have been otherwise disturbed, but fireweed is really so very common that if you live in a cool climate, it shouldn’t be hard to find. Look for the pretty pink flowers. Fireweed tea has a long history in Russia, where it’s called Koporye tea. Apparently there was a thriving fireweed tea industry in the Pacific Northwest when the Russians occupied it. You make fireweed tea by stripping the leaves off the stalks, bruising them in some way, letting them oxidize and ferment, then drying and storing them. This is more or less the same way traditional tea is made. Here is a video showing you how to do it. Once you’re all done, the result tastes very much like black tea, only with a fruity, almost pineapple-like aroma… and no caffeine. I like to drink it after my morning coffee on cold days, with a little honey and maybe a splash of cream. This is how I make fireweed tea. There are other methods, but I like this one because it's easy and results in a black tea-like drink that smells a bit fruity. Use scissors to cut fireweed stalks just below the last pretty looking leaf; fireweed leaves can get scraggly lower on the plant. Strip the leaves from the stalks and set in a bowl. 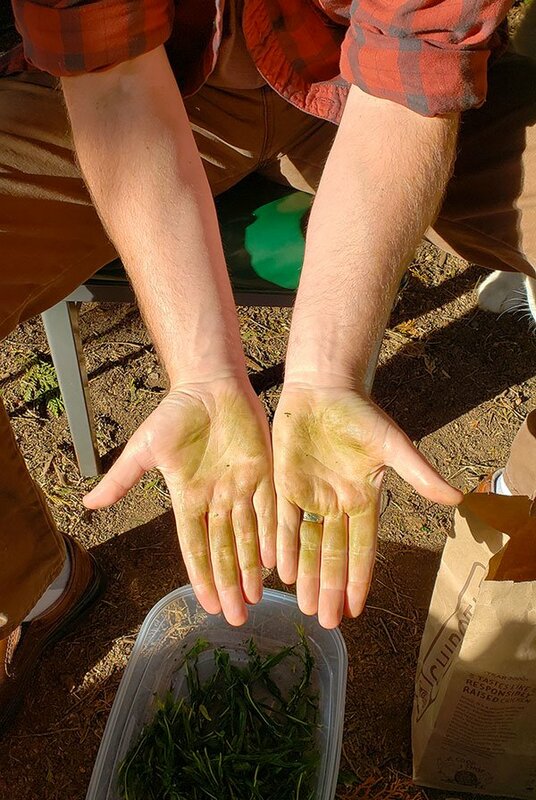 Grab a few leaves and using your palms, roll them vigorously together. You want to roll them into a fairly tight mass, bruising the leaves. Set the bruised rolls into a container that has a lid. When you have all the fireweed rolled and bruised, put the lid on the container and set out of direct sunlight at room temperature. Let this ferment for 2 to 3 days, moving the leaves around once or twice a day. You want an environment that's humid so the leaves don't dry out but not so humid they all mold. You will just need to watch it. Discard any moldy leaves. After the leaves are a very dark green, almost black -- two to three days -- lay them out in the sun to dry if you live in a hot, dry place. Other ways to stop the fermentation are to steam the leaves for about 5 minutes or roasting in a 350F oven for 20 minutes. I like the sun-dried and steamed methods. If you do steam, you'll then need to dehydrate the leaves anyway, so a steam bath followed by a hot period of sun drying makes the best tea. Store your tea in a Mason jar in a cool, dry place. I like to add a silica packet in there to prevent molding. The tea will keep up to 2 years this way. Brew as you would any normal loose leaf black tea. NOTE: Here is a fascinating article on experimenting with various fermented teas, including fireweed, from the Nordic Food Lab. 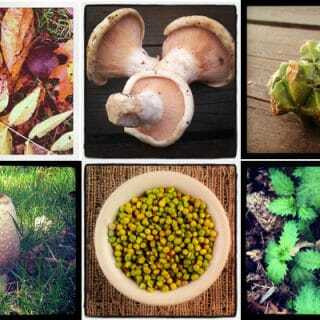 You can find dozens and dozens of recipes using foraged plants here on Hunter Angler Gardener Cook! 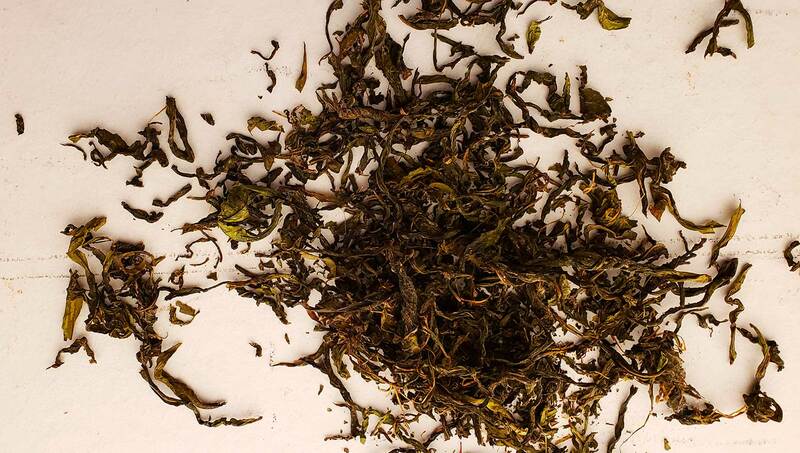 Here on the east coast we have yaupon which is another forgotten native tea. However, yaupon does have caffeine. Amy: I like making it when the last of the magenta flowers are blooming. You can do it slightly later, too. You want fully grown leaves. Dave: That’s funny, because that’s what I’ve been doing. Easier than pulling up the plant.